Definition: The process of cell division whereby chromosomes are duplicated and distributed equally to the daughter cells. It is also called as Equational division. 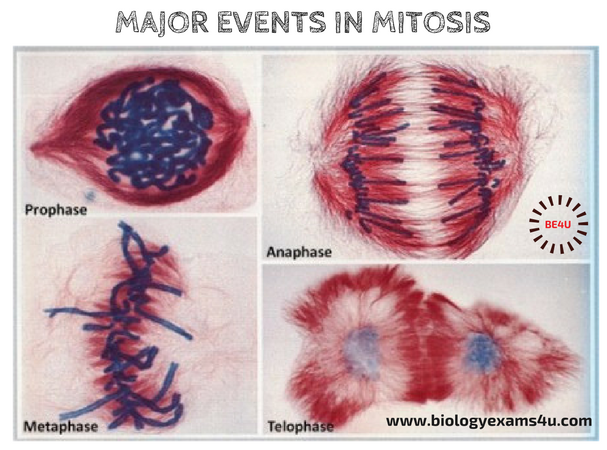 Mitosis is the cell division responsible for growth and repair. An adult human being is made up of billions of cells and all cells have the same genetic component. This genetic stability is achieved by mitosis. If crossing over and recombination is common in mitosis, then there will be variation in each cell division. So that the cells of an organism may be of high genetic variability and may lead to loss of function, harmony and even the individuality at the level of species. Mitosis leads to the production of two cells which are genetically identical to that of the parent cell (that is chromosome number remains the same). 1) Growth of the organism: An adult human being is made up of billions of cells and all cells have the same genetic component. This genetic stability is achieved by mitosis. 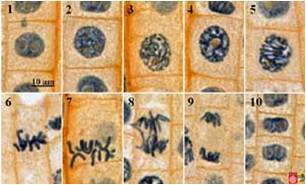 All these cells are formed from the first cell zygote by mitosis. Zygote divides by mitosis to form genetically identical daughter cells. 2) Repair: In the case of wound healing; that should be replaced with the same type of cells with the same genetic quality. This is achieved by mitosis.